With GMDX, Deus Ex’s weaponry is fully fleshed out. Highly polished and visceral, killing or subduing conspirators has never been this satisfying. Expanded weapon modding system, including new rate of fire, full-auto and damage mods, as well as a detailed weapon modding menu. A new secondary weapon system empowers the player. Recoil systems have been completely redesigned to behave realistically and yield greater gameplay depth. Un-silenced weapons are noisier (to a more realistic, actually relevant extent) and will alert AI in the immediate area (scales based on difficulty level). More reactive environment. Shooting certain objects, like a fire extinguisher, can have tactical results. Greater balancing, e.g no more useless PS20, and a sawed-off shotgun that should rival the assault shotgun more effectively. 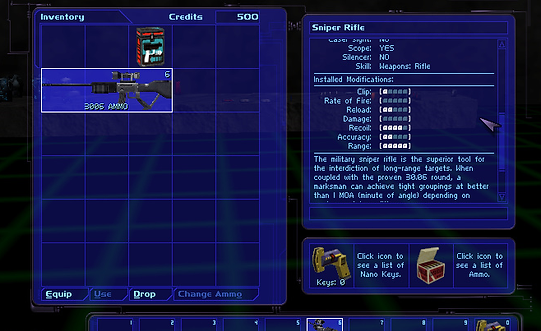 Many bugfixes relating to the weapons, and general polishing. A whole bunch more. No text list can do it justice. Bullets hitting objects now produce a wide variety of effects. New camera effects to give a visceral feeling of powerful recoil when shooting. Melee weapons now produce elaborate effects when used. Weapons that should be semi-auto now actually are. Ejected shell/bullet casings have been polished in a number of ways. The player can hear gunshots etc at further ranges. Shotguns fire 8 pellets rather than the vanilla 5. All projectiles produce enhanced visual effects. Weapon audio design has received a much-needed overhaul. New scope-in animation when using the scope. Scope toggle is no longer restricted by rate of fire. Scope view is twice as large. No longer automatically zooms back in after reloading whilst looking through the scope. New zoom toggle sound effect unique to the sniper rifle and plasma rifle. Range mods now affect projectile weapons by increasing projectile speed (and therefore potential range). Shotguns now accept range mods. Increases rate of fire. Compatible with most weapons. Increases damage. Compatible with most weapons. Take your weapon beyond the limits set in the original game. This is offset by generally tougher AI. Throwing knives bounce off of metal objects and can be retrieved from corpses. Fixed a bug with the plasma rifle’s damage, and it produces elaborate plasma effects. The mini-crossbow now accepts a bunch of new weapon modifications, and produces elaborate effects. Fixed a wide variety of issues with the Assault Gun. The starter pistol now accepts the silencer mod. This has been actively balanced with the stealth pistol in a wide variety of ways. The Dragon’s Tooth is no longer wildly overpowered VS organic targets and doesn’t laugh in the face of Low-Tech or Combat Strength investors, though still is the most powerful non-explosive in the game. Damage is nerfed VS NPCs, and remains approximately the same/is slightly more effective VS doors.